Sunday Morning Snapshot – Giant Snail! Ming Ming’s Diary – Singapore Roll! Hiya…Really hope you see this comment and reply …Can I ask how you actually got the Eczema and the cause?And how itchy from 1 to 10 …10 being the worst possible . Hi Joanne I don’t have this very often. It occurs like once every few years. Unfortunately I haven’t been able to discover the allergen for this. I’ll give it a 5 on the itch scale. I’m currently combating my daughter’s eczema now. It’s a full overhaul of diet and creams. Basically a lifestyle overhaul. Very happy that she’s showing great improvements. any remedy you have or does it go away by itself for you?? I don’t use steroids, because it doesn’t cure, it only masks the symptoms. So far I only experience this once every other year. I still haven’t discovered the trigger for it yet. During the period, I drink a lot of water (to flush whatever caused it out of the system) and eat probiotics (capsules). And I use natural creams on it to ease the itch and to make them go away sooner. Hfmd is a recurring retrovirus, and works in a similar fashion to herpes, residing in a dormant state within the body’s nervous system, they can become active under periods of stress or over-exertion. I have just determined I have a chronic case of it after I caught it from my children about six weeks ago. It’s called a progeny virus if you would like to read about the way it invades dna and replicates. Alkalizing the body with Apple cider vinegar and Hazelwood jewelry. There’s many options out there. Hfmd is one that is caused by feeling uncared for, so also addressing that aspect of dis-ease will go a long way.. I hope it clears up for everyone! 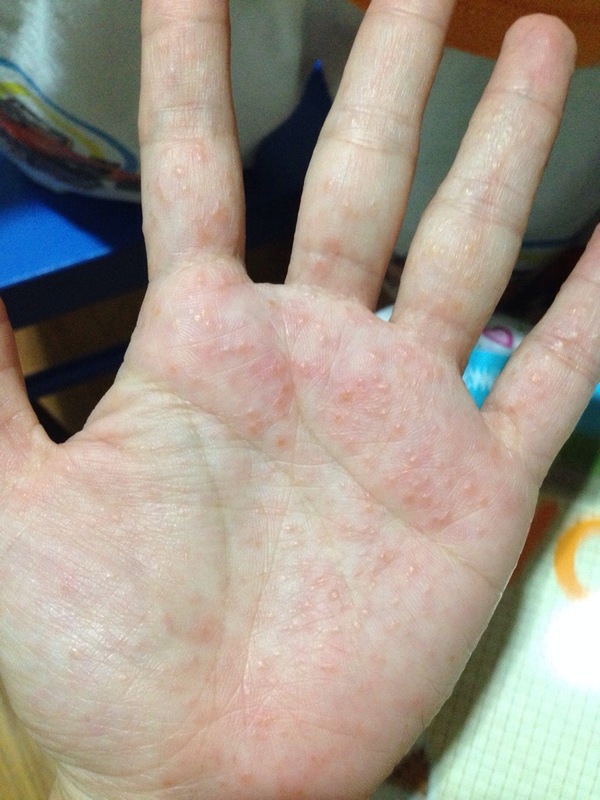 I happened to have found your blog post when I *googled* images for atopic dermatitis. I have lichen planus, which flares up every few years. It’s only on the soles of my feet (thank goodness) and the itching is almost unbearable, should I ever scratch it. I try not to even think or touch about it, but it’s truly a difficult thing to ignore.. I was misdiagnosed 5 times before a new dermatologist did a biopsy. I’m just curious if you’ve ever had a biopsy on your rash? 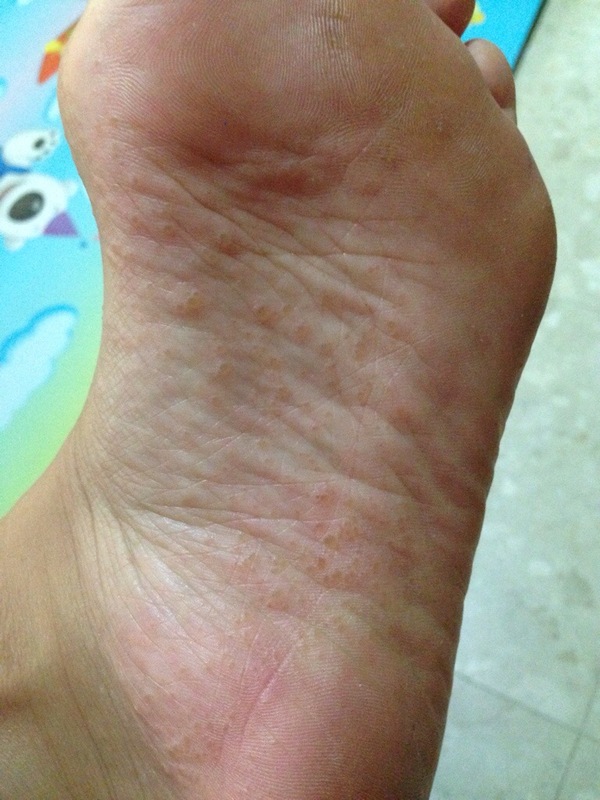 After looking at so many of the photos, and comparing what I had on my soles, it looks more like lichen planus than the HFMD. The photo of your feet is nearly identical to what mine look like during a full blown flare. Mine flares up during times of extreme stress… like moving… which I’m doing in two weeks… from Hawaii to North Carolina. So, even though it’s an expected move for my family and I, it’s still REALLY stressful for me. Anyway, I just wanted to ask about whether or not you’ve had a biopsy on it. Take care! It’s definitely not HFMD because no one in the family had that at that point of time. I probably had something which I was allergic to. But I didn’t have a biopsy because it kind of went away after 2-3 weeks. I don’t have it often. Maybe once every few years. Hi again! I don’t know where my brain was when I typed that, but I meant to type “dyshidrotic eczema,” not HFMD! Lol. The soles of the feet is not a *typical* area for Lichen Planus, BUT that’s exactly where mine showed up. 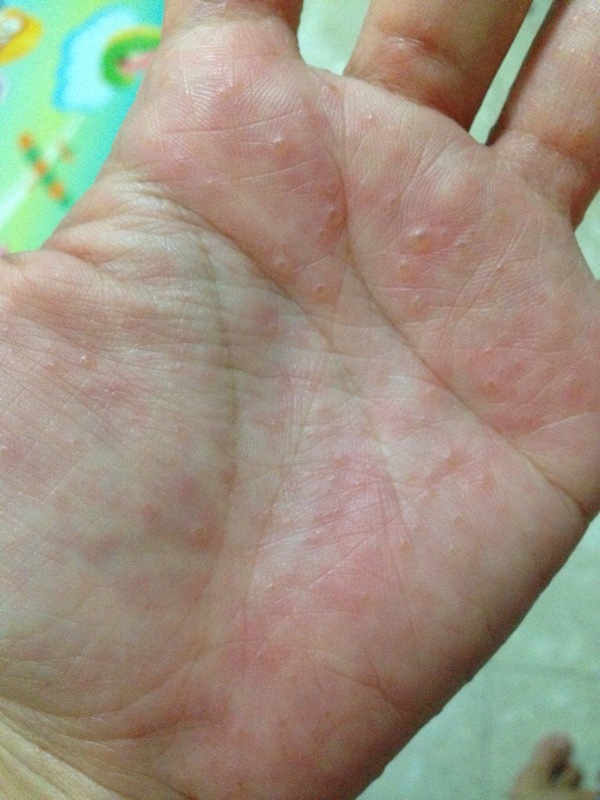 I also had a few areas on my palms/hands during my last flare. My advice is worth what you pay for it… but I would suggest getting a biopsy the next time you have a flare. Only because of the fact that some treatments for eczema can actually further irritate other autoimmune issues. And if you’re having an allergic reaction of THIS intensity, then it’s most definitely worth it in the long run to find out if it’s dyshidrotic eczema or Lichen Planus. I know the word “biopsy” tends to scare some people, but it’s not a big deal. The biopsy on my foot was quick, relatively painless, and I had the result within a week. Thanks Claire! I’ll most certainly do a biopsy the next time I get it. I was reading through the symptoms and photos. They look different from mine though. And they commonly manifest in other parts of body and seldom on palms and soles. I hope I don’t get them again! The itch was unbearable! !